In the final part of the series below, we examine how professional services leaders can adopt a ‘Broken Windows’ strategy in their firm to alter their employees’ antipathy towards training initiatives. We suggest leaders can do this by making it clear what will and will not be tolerated, by sending out clear signals to employees that the firm is one of cohesion, social responsibility and strong values and closely monitoring behaviour. Here’s how we believe professional services leaders can adopt a ‘Broken Windows’ strategy in their firm, similar to the New York case, to alter their employees’ antipathy towards training initiatives and to prove that “the way things are done around here” can change. For clarity, we have grouped our suggestions by three key components of the ‘Broken Windows’ strategy: ‘Social Norms’, ‘Social Signalling’ and ‘Monitoring’. 1. Zero-tolerance: There should be clear, non-negotiable standards for behaviour with consequences for non-compliance. Adopt a zero-tolerance approach for those who refuse to change the way they work after a training programme. 4. Operational Values: Your values need to be functional – not aspirational. There is no point stating how much you value training if everyone perceives in their day to day activities that this is not the case. It’s worth repeating: standards and values are not defined by neat mission or value statements (aspirations) but by what the firm is prepared to enforce. 5. Clear and agreed behaviours firm-wide: There is little point training people in new ways of working if there is a perception that these haven’t been defined, agreed and shared firm wide. We are not suggesting that all ‘rules’, ‘standards’, ‘approaches’ and ‘behaviours’ must be codified or written down – they can be informal. However, in top performing firms where values are agreed, shared and exemplified, there is rarely disagreement about what is and isn’t acceptable “around here” and non-compliant behaviours are dealt with quickly and transparently at every level. For this to be enabled ‘feedback’ needs to become a cornerstone of the culture and not just ‘top down’. 6. Align training with metrics: New skills, behaviours and frameworks must be aligned with your firm’s performance metrics. It is very difficult to signal to employees that you want them to adopt new ways of working if they perceive conflicting messages around what is and is not expected of them. By fixing ‘broken windows’ as soon as they are found, you send the signal that the firm is closely monitoring behaviour. Consequently, employees are less likely to return to the way they have always worked after a training programme. 7. Monitor: Non-compliant behaviours are dealt with quickly and transparently at every level. After a training programme, leaders must be proactive in checking whether new approaches are being adopted across the firm. Strict ‘policing’ in a professional services firm is unrealistic and unnecessary but leaders need to be alert and to see for themselves the approaches people are using and gently feedback on unwanted behaviours. For this to be enabled, ‘feedback’ needs to become a cornerstone of the culture and not just ‘top down’ – are your Partners ready for feedback on their behaviours too? 8. Consequences: There need to be consequences for not using newly acquired behaviours. We are not suggesting that consequences should be draconian or overly formal, instead leaders need to have a simple discussion regarding which ways of working are and are not acceptable. i. Firms should ensure they have management teams who are able to undertake these types of potentially difficult coaching discussions. 9. Consistency: Crucial to the broken windows strategy is consistency. Leaders cannot overlook any deviation from the agreed behaviours as this could signal that you are willing to overlook a more serious departure in the future. There must be a ‘doctrine of consistency’. This will be particularly difficult if the short-term benefit of deviating from the new behaviour is hard to resist. For example, could you insist that an employee uses a newly learned approach even if it meant on this occasion they would find it harder to meet the deadline? 10. Courage: It is not trite to say that leaders need to show courage and bravery to challenge those failing to demonstrate the required behaviours, particularly if it is a fellow Partner or Senior Manager. Consistency demands ‘one rule for all’. The result is the overriding perception that training is meaningless, insignificant and inconsequential, with indifference and apathy the prevailing attitudes. However hard it is to admit, predominant perceptions and attitudes held by employees towards training are a direct result of the attitudes and behaviours they perceive the firm’s leaders attach to training. We believe a ‘broken windows’ approach provides an excellent framework to addressing the failure of training initiatives. Leaders must send the signal to employees that unwanted behaviours will not be tolerated; they must exemplify the behaviours and standards they expect to see; and actively demonstrate that behaviour is being monitored, with consequences for non-compliance. While it may initially be difficult for leaders to change their employees’ perception that they are indifferent towards training – but there is some good news. Once employees do start to recognise the value placed on training, and desired behaviours start to be embedded and shared firm-wide, managers need do little to sustain the change because the employee group will enforce the standard. In other words, employees will not ‘break a window’ in the first place because they know that this non-compliant behaviour won’t be tolerated by their colleagues in the firm. Maister was right, (most) training in professional services firms is still not achieving the results stakeholders would want to see. Professional services leaders need to prove to their teams they have the desire, influence, clout and motivation to ensure the adoption of newly learned behaviours, skills or frameworks. Returning to the way we’ve always worked after a training programme will not be an option because, categorically, “that is not the way things are done around here any more”. It’s time for the leaders in your firm to start fixing some broken windows. Within professional services firms, it is easy to see how the ‘Broken Windows’ theory might be applied to other scenarios beyond training. 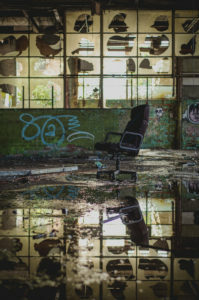 Below we have listed some ‘broken windows’ we have found in professional services firms which might seem inconsequential at the time but which send signals to employees about the way things are done around here and influence future behaviours. Leaders should ask: By taking these actions, what signals do we send to the rest of the firm and our clients? If we continually condone and tolerate these behaviours, what will become acceptable next?